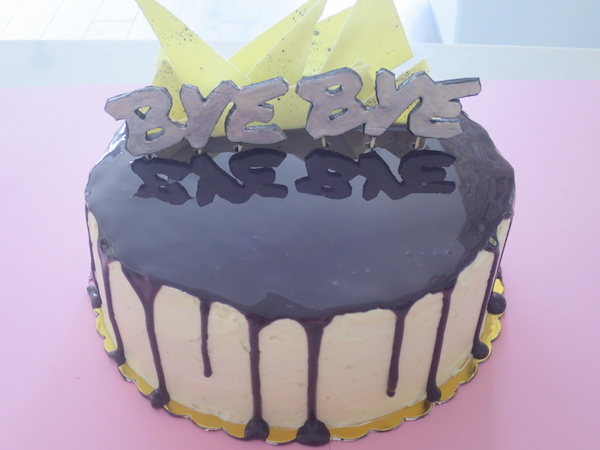 No one likes goodbyes, but everyone likes a good cake, right? 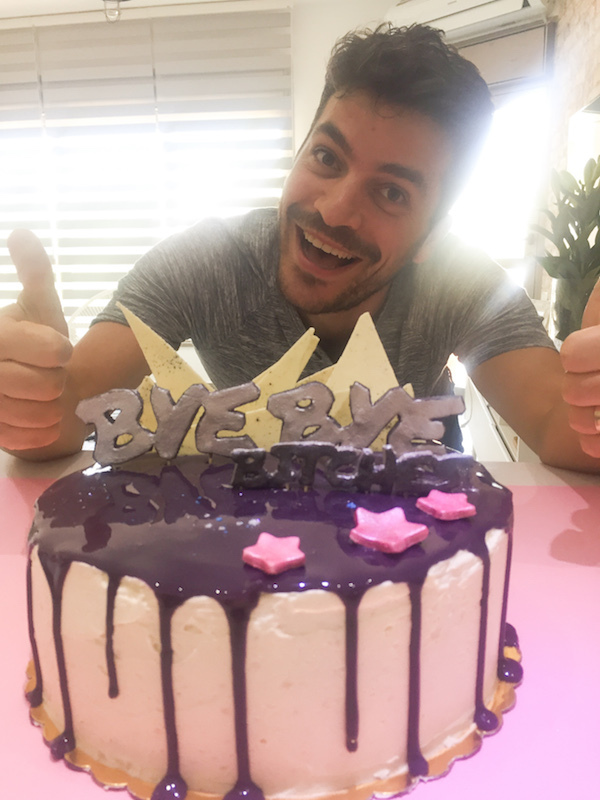 As someone who has relocated twice I’ve said too many goodbyes, some that were the last and some that are only temporary and therefore replaced with “until I see you again”. 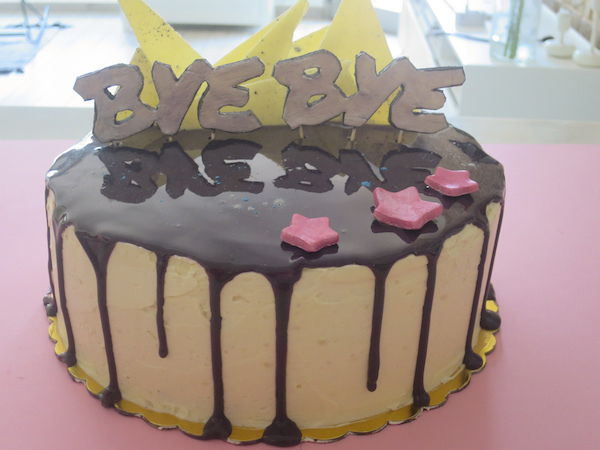 One thing I’ve learned is to make goodbyes sweet ones! The graffiti like text was created with white modelling paste sticked with toothpicks and painted with edible silver and black food colouring. The non-pictured addition of the naughty world was smaller sized and dyed black. The glaze is super shiny as you can see from the pictures – it reflects the standing decorations very clearly. My chocolate bark was very thin and didn’t make a car drive in the current heat we are having in Tel Aviv. 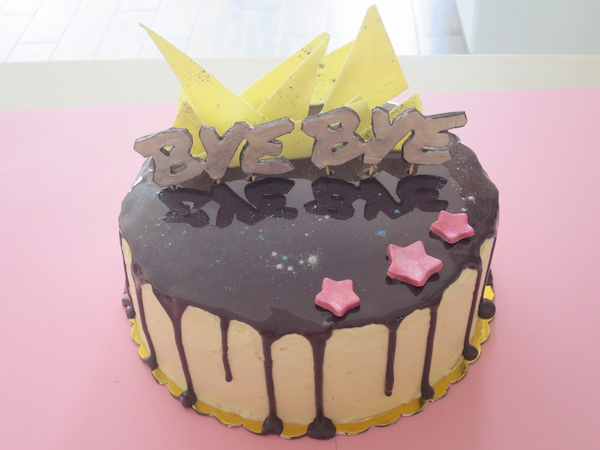 The cake decor was inspired by Galaxy Drip Cake demonstrated in the latest issue of Food Heaven ‘Cake Decorating heaven’ magazine. Chocolate cake with white chocolate Swiss meringue buttercream, white chocolate mirror glaze drip and white chocolate bark. Preheat oven to 160ºC (320ºF) and line two 23 cm/9 inch cake tins with parchment paper. Place sugar and butter in a mixing bowl and start beating on medium speed until incorporated and creamed. Add eggs and vanilla and continue to beat until smooth and shiny. Add sour cream and melted chocolate and continue to beat on low speed. In a separate bowl combine cocoa powder, flour, baking powder and salt then add to the main mixture in two additions. Continue to beat only until incorporated, then divide to the prepared cake tins and bake in preheated oven for 35-40 minutes until a toothpick inserted in middle comes out clean. Lift onto a wire rack and leave to cool. Prepare gelatin mass from gelatine powder mixing into water and set aside. In a small saucepan bring water, sugar and glucose syrup to boil and to 103 degrees Celsius (217 Fahrenheit), then take off the heat. Add condensed milk, white chocolate and gelatine and start blending with immersion blender. 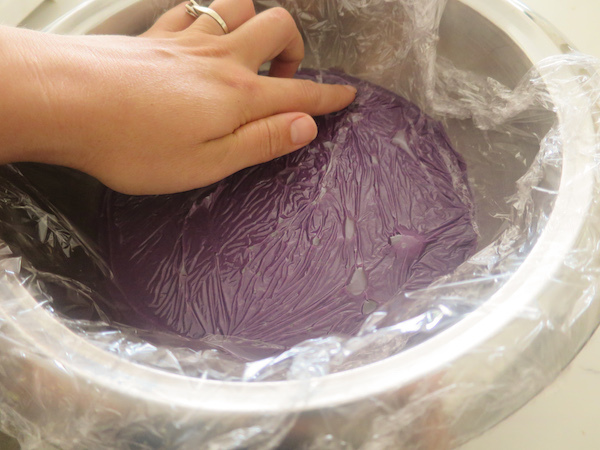 While mixing add colouring to dye the glaze, preferably adding gradually to achieve the desired hue. Pass the glaze through a sieve and cover with plastic wrap touching he surface to eliminate any possible air bubbles. Refrigerate for 12-24 hours, then reheat over a double boiler to melt and bring to 34 ºC (90-93 ºF) when ready to use on the cake. Then remove from heat and place in mixer by starting to beat on medium speed and gradually increase to maximum speed, whisking until glossy and the bowl is cool. Then turn on low speed and gradually add butter a cube at time and continue to whisk until smooth, this can take up to 15 minutes. Finally add vanilla and salt whisking on high speed until incorporated. Pour the chocolate on an acetate sheet on spread to even thickness, then sprinkle some edible silver dust on top. 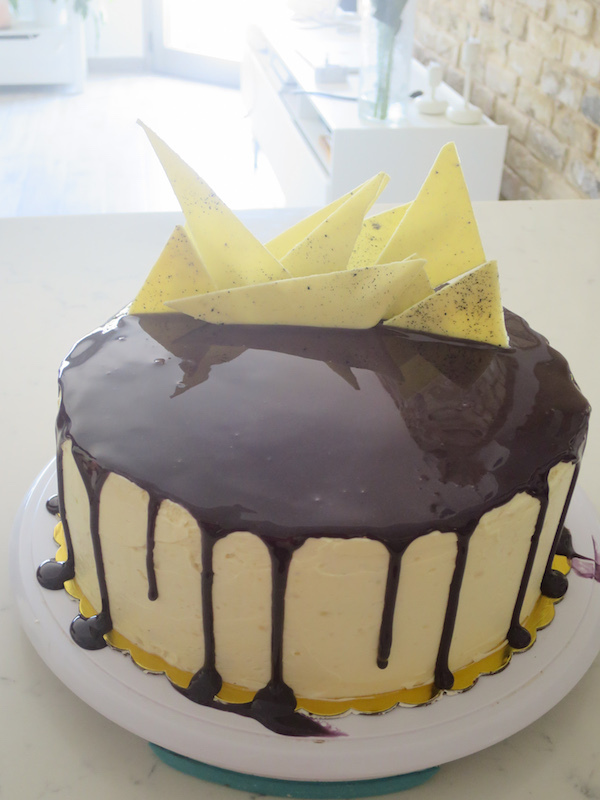 Place in a refrigerator and break into large shards when ready to decorate the cake. Once the cakes have cooled, level them and cut each to two layers. Use a drop of buttercream to attach bottom layer onto cake board, then using the buttercream fill each layer and stack on top of each other. Crumble coat the cake and refrigerate to let it harden. 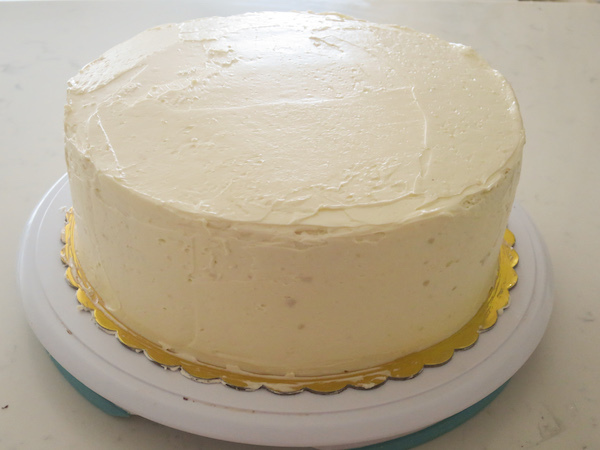 Then add final layer of buttercream to frost the cake and refrigerate while preparing the glaze and decorations ready. Start pouring glaze from the middle of the cake until it almost reaches the edge and use a small spatula to encourage dripping on the sides. 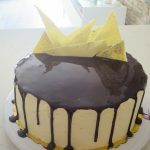 Place chocolate shards on top of the cake. Add any additional decorations and edible glitter dust on top. Refrigerate until serving. Tempering white chocolate - first melt the chocolate, then cool it to 26-27°C (79-81°) and carefully over water bath reheat to working temperature 27-28°C (82-84°F).